We listen to our customers, and we know that what's in your food matters to you, We also know that you want products that have fewer synthetic ingredients and additives, and that those products can be hard to find. That's why we've created H-E-B Select Ingredients to help you easily identify our products made without artificial flavors, high fructose corn syrup, certified colors, and hundreds of other synthetic ingredients. You'll find hundreds of H-E-B Select Ingredients products throughout our stores, with many more on the way. 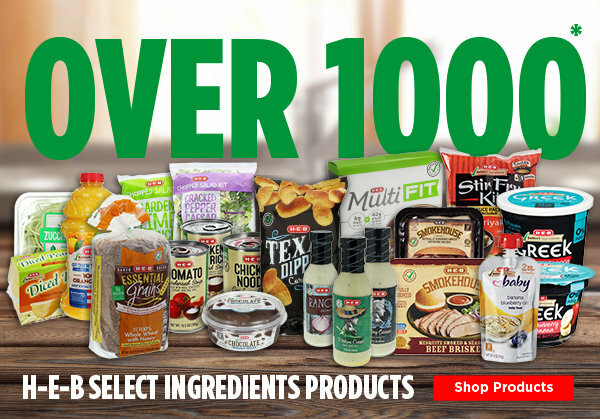 Just look for the green checkmark and H-E-B Select Ingredients on the packaging and rest assured that you will find the same quality you expect from your favorite H-E-B brands. H-E-B Select Ingredients products gives you everything you want, and nothing you don't including a high price tag! *Online selection may differ from full in-store assortment. Product assortment varies by store. What is in H-E-B Select Ingredients products? What we put in is just as important as what we leave out. Our team of experts carefully chooses each ingredient that becomes a part of every H-E-B Select Ingredients product. We've taken the guesswork out by providing an easy to read list on the back of many of our products so you know exactly what you're getting and what you aren't.